Officers in an unmarked HGV have been filming drivers in Northamptonshire not wearing a seat belt and using their phones at the wheel to crack down on people breaking the law. The Safer Roads Team at Northamptonshire Police this week were driving in convoy with two police cars on Highways England roads - particularly the M1, A45, A14 and A43 - in an unmarked HGV. The unmarked HGV is back on patrol to improve safety on Northamptonshires roads. The cab, which was on loan from Highways England for three days, enables police officers to easily spot, record and photograph motorists breaking road traffic laws either by reading maps, using their mobiles, not wearing a seat belt, or in one circumstance, re-heating baked beans at the wheel. PC Dave Lee was driving the HGV on Tuesday (August 21). He said: "It gives us the ability to be out and about looking for drivers of all types of vehicles, not just HGVs. "We're looking at vans and cars too. It gives us the ability to look at what drivers are doing out there on the roads. "If we were in a fully marked police vehicle, nine times out of 10 they would have clocked us and stopped doing what they are doing, whereas being in something as big as this gives us the ability to actually look and see what people are doing, observe and capture that as evidence before the interceptors stop and deal with the drivers." PC Rob Monk was filming drivers in the county on Tuesday who were breaking the law. More than half of the vehicles stopped by the team between Monday and Wednesday were HGVs (24). A total of 46 traffic offence reports were issued to drivers – these will be followed up by letter, detailing how the offence(s) will be dealt with, for example through prosecution, penalty points, paying a fine or attending a driver education course. Four drivers were given words of advice, two were given graduated fixed penalty notices, and one vehicle was seized. One driver who wasn’t stopped for using a mobile phone at the wheel was subsequently arrested on suspicion of drug driving. PC Dave Lee of the Safer Roads Team said he is finding an increase in drivers using their laptops and iPads while driving. 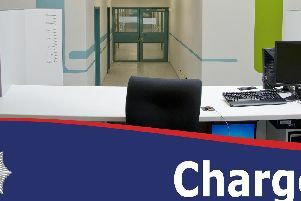 PC Lee added: "Quite often what we've found, as we have this week, a relatively minor offence of people not wearing a seat belt can quite often snowball into more serious offences. "A driver, which we stopped this week, had exceeded his drivers hours, which then potentially puts him behind the wheel of a 40 tonne artic lorry, which is dangerous." The penalty for using a handheld mobile phone while driving is now a £200 fine and six penalty points. The police HGV was last used for a week-long sting by police at the end of March where a total of 44 offences were detected. The Mercedes lorry was in action with Northamptonshire Polices Safer Roads Team from Monday to Wednesday (August 20-22). Some of those included 11 mobile phone offences, 29 drivers not wearing seat belts and three people found to not be in proper control of the vehicle. The cab, which has also been working cross-border with Leicestershire Police, is paid for by Highways England and has been booked seven times this year by the force who just pay petrol fees. Cab driver PC Dave Lee was sat alongside PC Rob Monk whose duty it is to film drivers breaking the law in case they appeal against the decision and take it to court. PC Monk said often other drivers are in disbelief that the police are now driving a lorry and have made obscure excuses for being trouble. Some motorists thought the officers were YouTube vloggers and the police have often been on the receiving end of rude hand gestures. One time - back in 2010 - PC Monk stopped a driver for swerving across the A45. The lorry took to the counties main A roads this week, including the A45. It soon came to light that the driver was in fact drunk - but more surprisingly he had connected his laptop to the Internet and was checking the stock market shares while three canaries flapped about inside the vehicle.